The dust has settled and I finally have an opportunity to sit down and thank you for such a great move! Tracy and Ramone went above and beyond the call of duty in moving my art studio which included a couple of especially odd pieces – my large and heavy 9′ loom and a large, heavy and fragile light table. Tracy had a great eye for disassembling and then, reassembling my loom. I was standing there scratching my head and he had it all figured out – and, best of all, there were no left-over pieces! My light table was heavy and needed to be turned on it’s side and fit through an opening just large enough to accommodate it – they aced it! And when it came time to move my outdoor potted plants, I discovered that the locks I had secured them with (as a theft deterrent) had rusted so that my keys didn’t work. Ramone was determined to cut through the cables even though we didn’t have the right tools. With persistence and a lot of elbow grease, he did it. They really did such a stellar job, I cannot thank them or you enough. 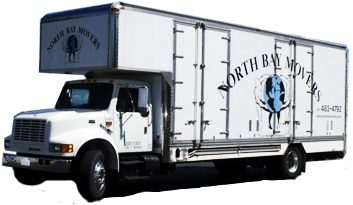 Thank you, David – I will sing your praises every chance I get and highly recommend North Bay Movers.